Patients with personality disorders need targeted treatments which are able to deal with the specific aspects of the core pathology and to tackle the challenges they present to the treatment clinicians. Such patients, however, are often difficult to engage, are prone to ruptures in the therapeutic alliance, and have difficulty adhering to a manualized treatment. 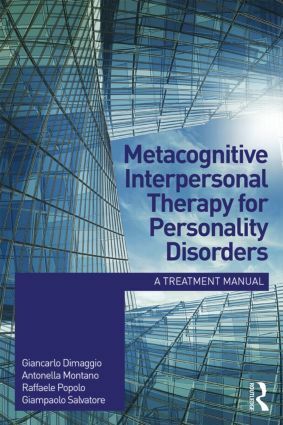 Giancarlo Dimaggio, Antonella Montano, Raffaele Popolo and Giampaolo Salvatore aim to change this, and have developed a practical and systematic manual for the clinician, using Metacognitive Interpersonal Therapy (MIT), and including detailed procedures for dealing with a range of personality disorders. The book is divided into two parts, Pathology, and Treatment, and provides precise instructions on how to move from the basic steps of forming an alliance, drafting a therapy contract and promoting self-reflections, to the more advanced steps of promoting change and helping the patient move toward health and adaptation. With clinical examples, summaries of therapies, and excerpts of session transcripts, Metacognitive Interpersonal Therapy for Personality Disorders will be welcomed by psychotherapists, clinical psychologists and other mental health professionals involved in the treatment of personality disorders. "A new inspiring, reader-friendly, clear, concise book written to help clinicians deal better with the most difficult-to-treat patients in their caseloads. Introduction. Personality Disorder Psychopathology: Form and Contents of Subjective Experience. Personality Disorder Psychopathology: Functions. Assessment and Case Formulation in Metacognitive Interpersonal Therapy. Step-By-Step Formalized Procedures. Therapeutic Relationship. Shared Formulation of Functioning: Enriching Autobiographical Memory, Improving Access to Inner States and Reconstructing Schemas. Promoting Differentiation. Construction of New Self-Aspects: Access to Healthy Parts, Exploration, Increase in Agency, Overcoming Avoidances. Promoting the Understanding of the Other’s Mind and Integration. Treating Symptoms and Promoting Mastery of Relational Problems. Comparison of Metacognitive Interpersonal Therapy and Cognitive-Behavioral Therapies. Appendix: Diagnostic Instruments Usually Adopted in MIT. Giancarlo Dimaggio is a co-founding member of the Center for Metacognitive Interpersonal Therapy. He is the author of four books and numerous articles. Antonella Montano is a founding member and director of the psychotherapy school A.T. Beck Institute for Cognitive Behavior Therapy. He is a teacher and supervisor of the Associazione Italiana Analisi e Modificazione del Comportamento (AIAMC), a certified trainer/consultant/speaker/supervisor of the Academy of Cognitive Therapy (ACT), a member of the International Association for Cognitive Psychotherapy (IACP) and a member of the International Society for Sexual Medicine (ISSM). Raffaele Popolo is a co-founding member of the Center for Metacognitive Interpersonal Therapy, a trainer at the Società Italiana di Terapia Comportamentale e Cognitiva (SITCC)a trainer of the psychotherapy school ‘Studi Cognitivi’. Giampaolo Salvatore is a co-founding member of the Center for Metacognitive Interpersonal Therapy, a trainer at A.T. Beck Institute for Cognitive Behavior Therapy.